What more could a Girl Raised In The South (G.R.I.T.S) ask for in NYC? 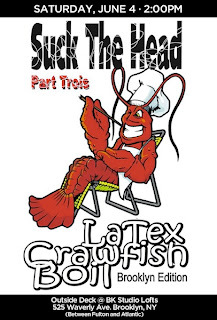 What: Annual LaTex (Louisiana-Texas) Crawfish boil includes BK chillin', crawfish eating, southern living, dirty south dancing and a live performance by Houston's own Young Script. There will be over 300 lbs of crawfish on deck, hand grenades (that's a drink, ladies), and pure fun. Well the purity of this party probably depends on how many hand grenades you have. Keep it classy ladies! Why: You love southern folks, wish you were from the south, and/or love crawfish. If none of these apply rest assured that it will be a good time if nothing else and proceeds in part go directly to benefit the LDRF. Set your summer out eating and giving back! But: It will be hot and eating crawfish can get dirty! I suggest wearing you best casual street chic ensemble.